I met Mitch and Katie as they were beginning to take their next big relationship step. As we talked about engagement ring designs and looked at diamonds, the excitement grew and grew. These two are sweet, open-hearted, adventurers and I enjoyed every minute I got to spend with them. 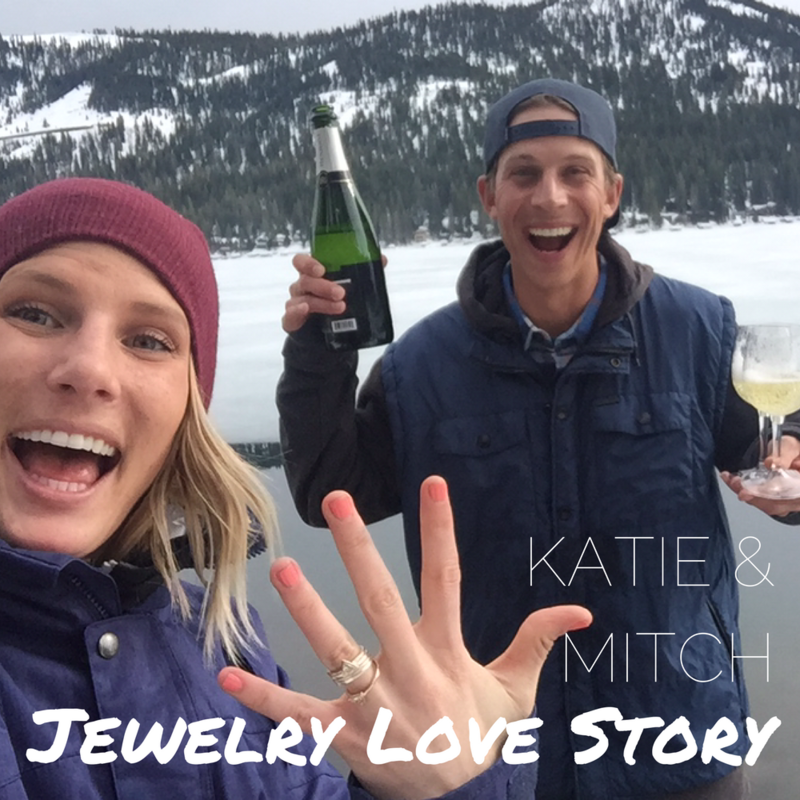 After finishing Katie’s engagement set, Mitch surprised Katie with the finished rings and champagne on a pier on Lake Tahoe- at the very spot where they began their relationship years earlier (I nearly melted when I heard this!). Wishing every happiness to these two Santa Rosa-based sweethearts. Katie: What gives me butterflies is when Mitch talks about our future together. We’ll spend an afternoon daydreaming about how wonderful our lives are now and how wonderful they will be in the future. Mitch is a dreamer at heart, he thinks big and sees the big picture. I love his style of living life. He refocuses me on what is important. Mitch: Katie’s sense of adventure and lust for the unknown is what gives me butterflies. Our next big adventure is sailing! We just bought a small sailboat together, which marks our first big purchase as a couple. We are planning some weekend trips out on Tahoe this summer and out from Petaluma to the Bay as well. Our daily ritual is cooking. Mitch was on a strict anti-inflammatory diet for almost a year, and since then we have spent a lot of time and energy in finding delicious ways to cook healthy at home. We open a bottle of wine, put on some smooth Cubano music, light candles and chop, season, prepare our food together. Here’s the icing on the cake, cleaning up the kitchen after has also become one of the most fulfilling rituals at the end of the night. There is nothing better than a clean space after a wonderful evening. The most realistic marriage advice I have received is that relationships are in constant need of attention. We pay attention to our jobs, our health, our bank accounts – but we don’t actively pay attention or invest in our relationships. Take time to invest in each other and grow together. Another favorite: LAUGH, as much as possible. You guys brought in heirloom family gold to use in Katie’s engagement rings. I’d love it if you would share the background of where that gold came from. Katie: My grandfather, Bob Burkhard was a dentist in Downieville, CA and he would get customers who would pay him with gold nuggets. Over time he collected quite a few. My Dad’s wedding ring is made out of the nuggets from the North Fork of the Yuba River as well and Mitch and I loved the idea of pulling that family heritage into our rings. Katie brought out the gold nuggets from her grandfather and we melted them into her engagement ring. Mitch took to the casting process like a fish to water. I hope you love how Katie’s rings turned out. Can you share your experience? 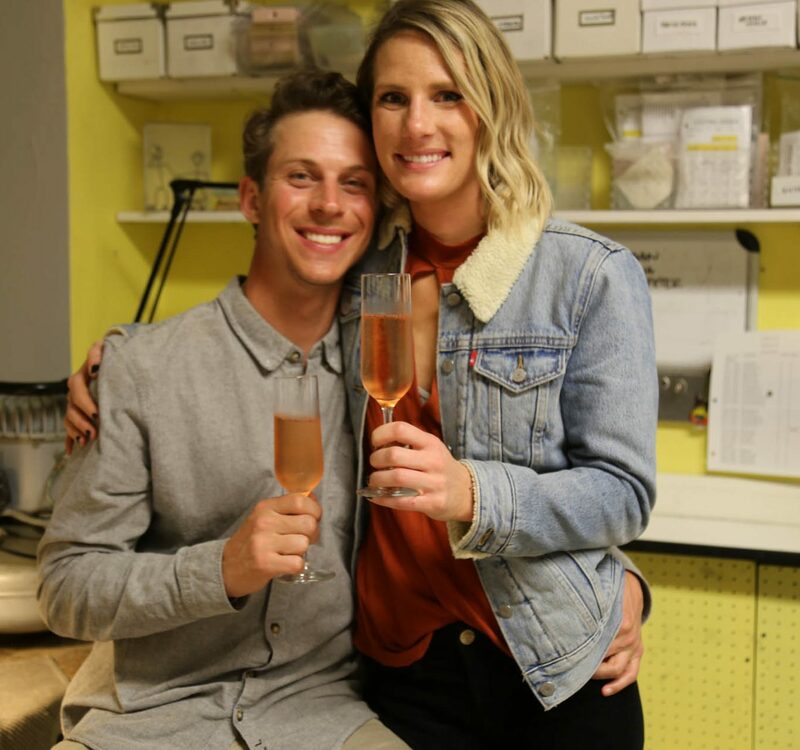 Our experience with Kendra designing our ring and walking us through the process was unforgettable and so special to us. We loved every step and love to tell the story of how this ring came to be. We decided to design the ring together since we had been together for a few years and thought it would be special to do together. We fell in love with Kendra and her take on jewelry design. She walked us through the design process and each step that we would be taking with her through this experience. She offered us plenty of room for our opinions and questions and welcomed our ideas. Her wax models were perfect and just seeing our design come to life was very exciting! 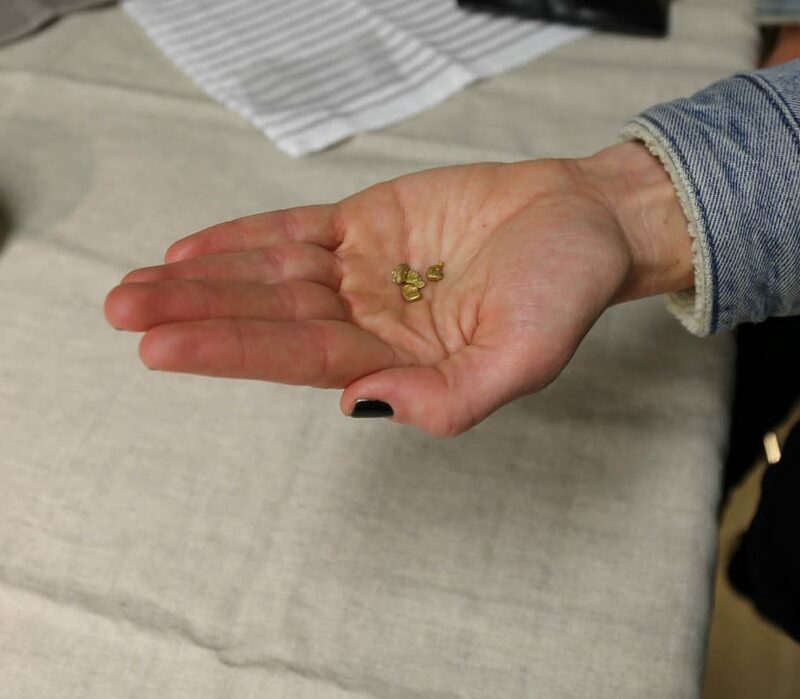 We wanted to use some heirloom gold nuggets that were given to us from Katie’s grandfather. Having the option of adding this sentimental element to the design was something that we will forever cherish. Actually experiencing the Double Pour Workshop was amazing! 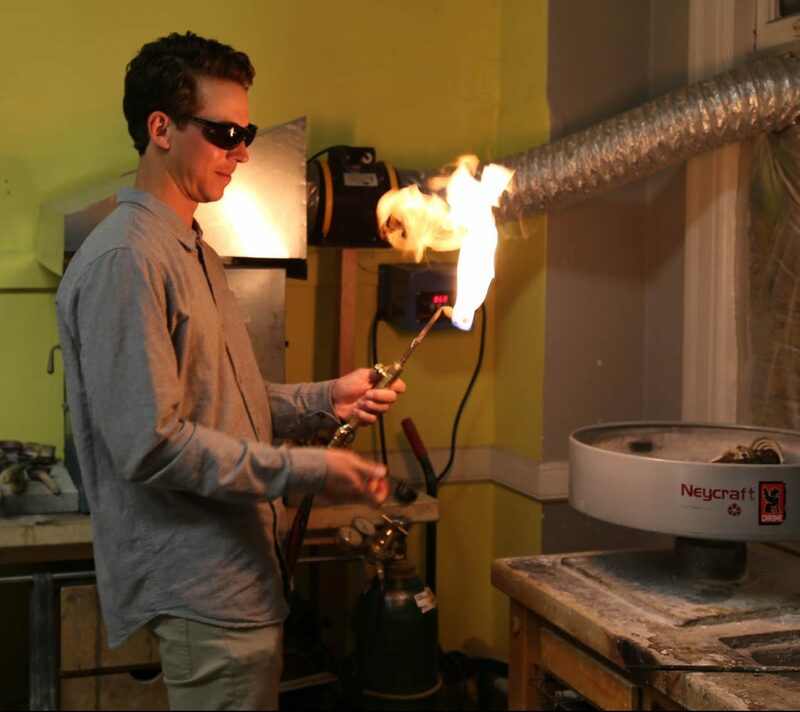 Kendra brought us into her casting artist’s studio to participate in the casting of our rings and we both had such a great time playing an active role in melting down our precious metals into a beautiful ring set. 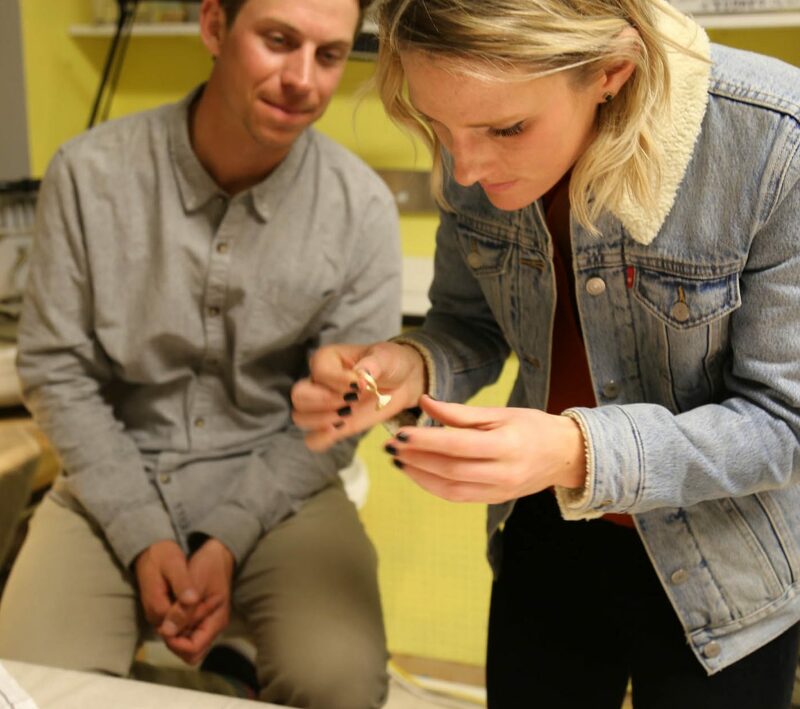 Watching our rings come to life from the molds and emerge from the casting clay was unforgettable and a beautiful insight to the intricacy and artistry of Kendra’s design and the beauty of jewelry making. 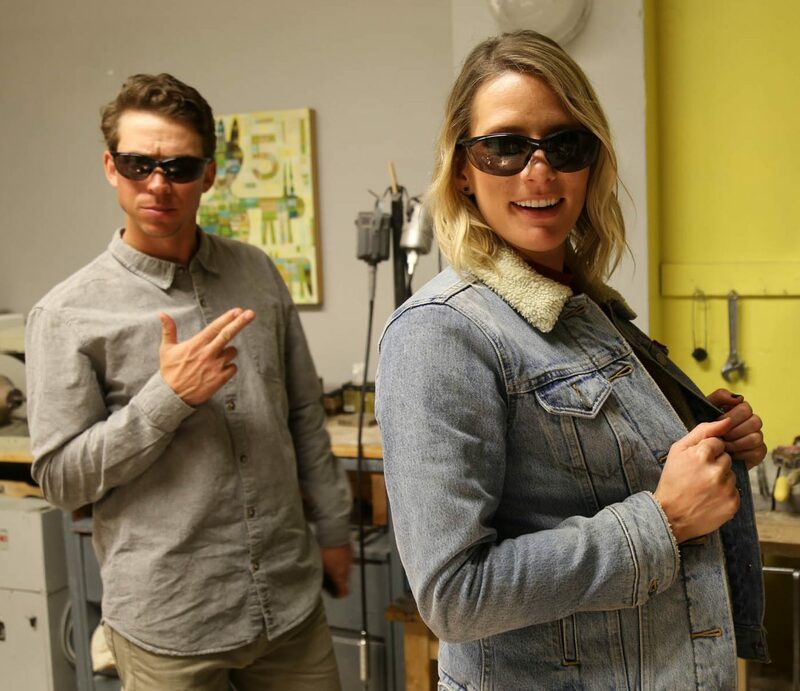 Katie and Mitch show us how to properly rock safety glasses. 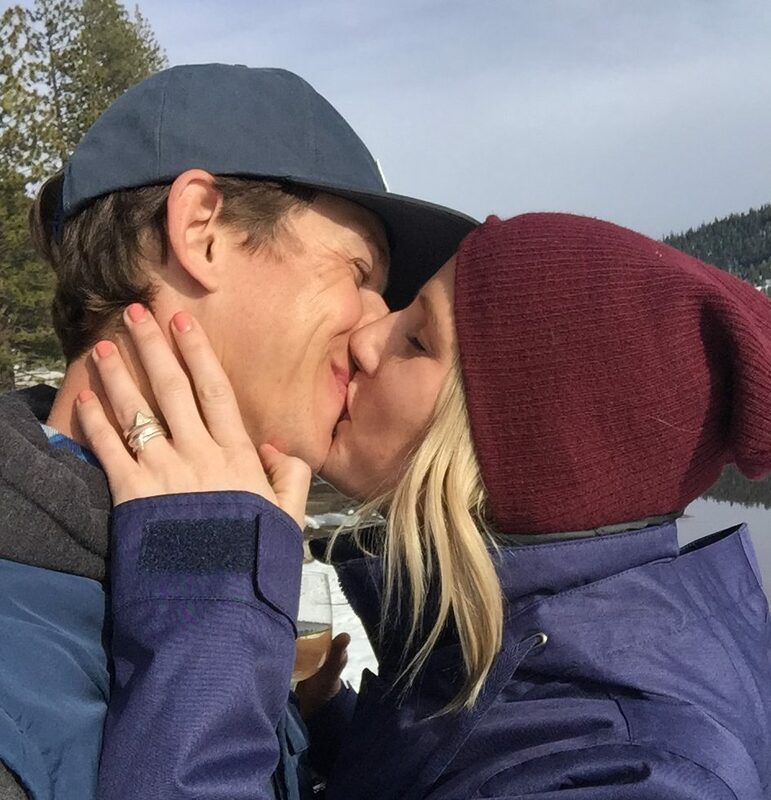 Kendra even played into the element of surprise with the proposal! 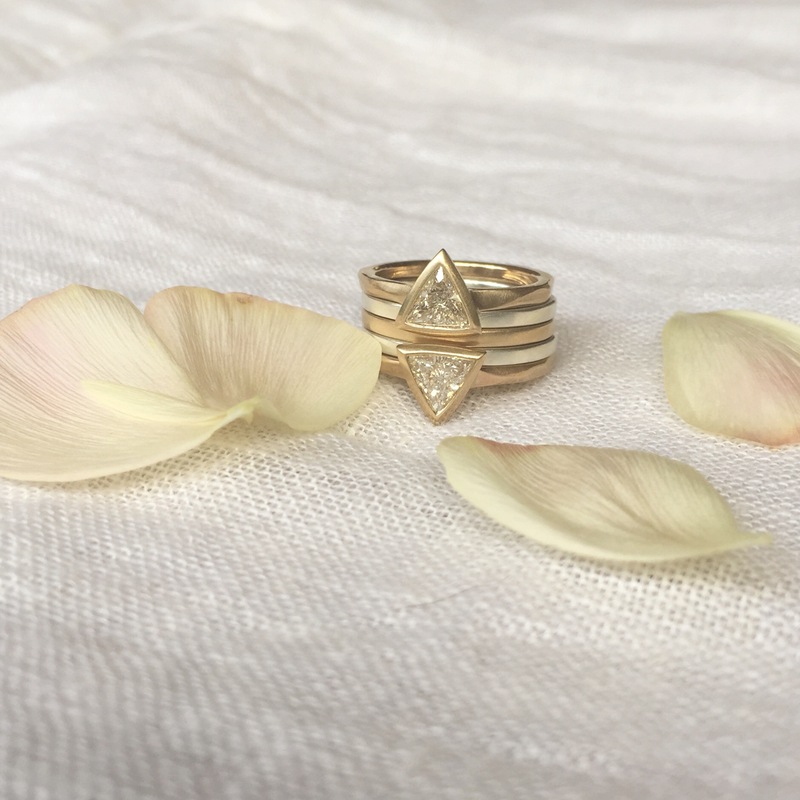 We cannot talk warmly enough of Kendra Renee Jewelry and our experience with her and the design of our rings. Kendra, you will always be a little (sparkly) part of our lives and we are so grateful for your beautiful work! The finished set. Mitch and Katie, thank you both! And congratulations!